I was present at the Raytown polls on election day for the August primary. While there, I noticed Alderman Joe Creamer engaged in a long conversation with an election judge. I talked to Creamer afterwards and he stated that the Jackson County Election Board initially did not have a record of his residency. Eventually, the problem was cleared up and Creamer was allowed to vote. 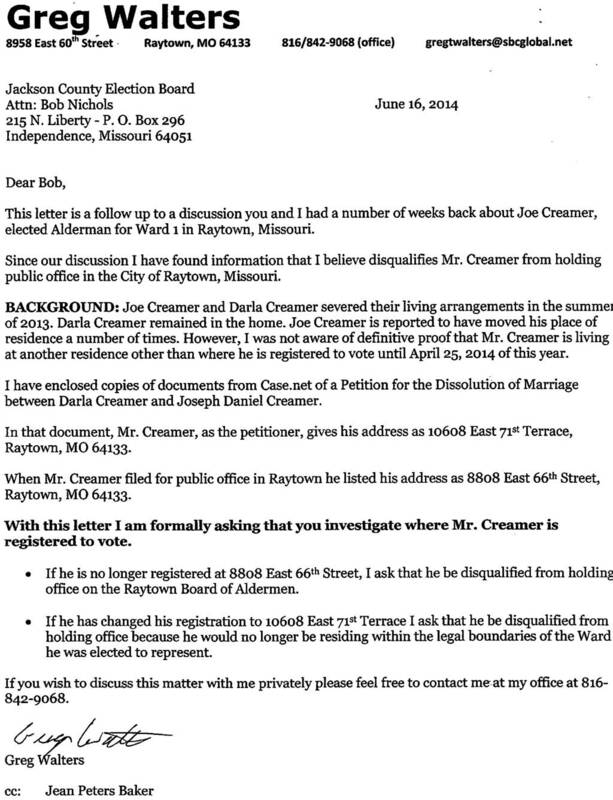 Alderman Creamer contacted me several days later to tell me he was sending letters about his problem at the polls to the editors of Raytown’s print media as well to Raytown Online. 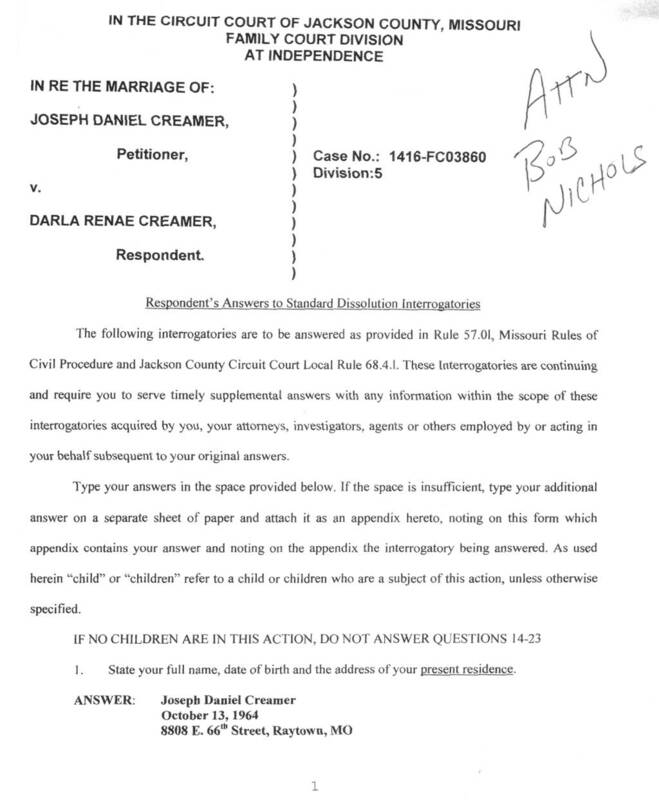 He indicated that the source of the problem was a complaint from former Alderman Greg Walters, who was using Creamer’s upcoming divorce to challenge Creamer’s right to claim his home as his legal residence. The Jackson County Election Board received a request from Greg Walters to investigate your voter registration regarding your residency. As discussed with you this morning, I will turn over all the paperwork you gave us to our Board’s attorneys. We will advise you of the outcome. 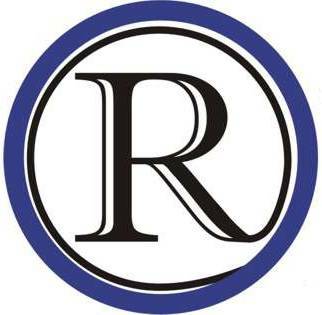 Robert C. ( Bob ) Nichols, Jr. The next step in my investigation was to verify Creamer’s copy of the email with the election board. The election board not only verified the validity of the email, at my request, they also provided me with a copy of Walter’s complaint letter. Click HERE to download a PDF version of the letter or scroll down in the article. I will leave it to the readers to decide why Mr. Walters cited City Hall as the source of an investigation that he appears to have instigated. Next, I obtained a copy of the divorce papers Mr. Walters referred to in his letter to the election board from Alderman Creamer. Creamer provided me with a copy and you can click HERE to download a PDF version of the relevant pages, or scroll down to the bottom of this article. From the divorce document, it is clear that Alderman Creamer lists the home he owns in Ward 1 as his permanent residence. 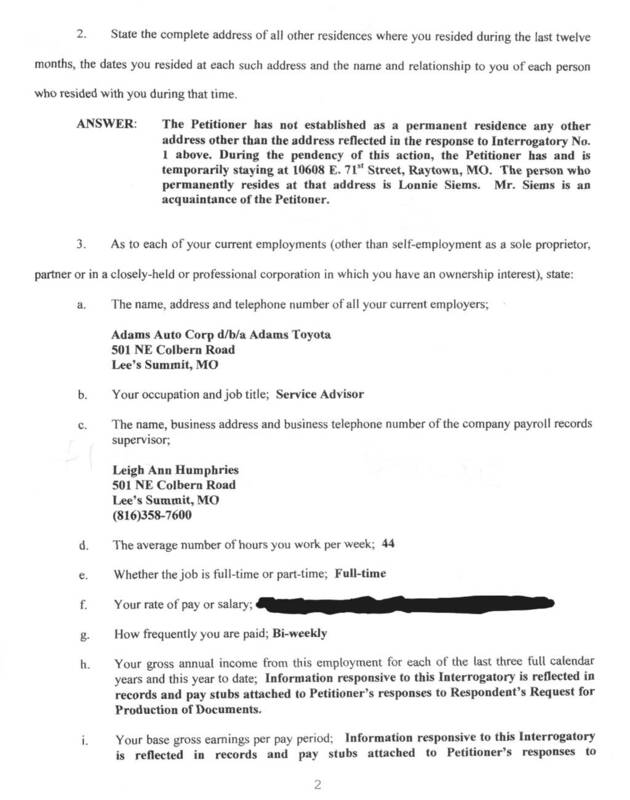 The document also lists a temporary address in Raytown, but outside Ward 1, as his residence while the divorce is concluded. The Jackson County Election Board ruled in Alderman Creamer’s favor, allowing him to vote based on his permanent, home address in Ward 1, Raytown. Is this a case of a Raytown elected official breaking the rules by sleeping somewhere besides his home while a divorce proceeds, or it a case of a political adversary taking advantage of Creamer’s marital problems to make more trouble for him?